Amidst the cheering crowd when the two captain came in the middle of the field to toss the coin. 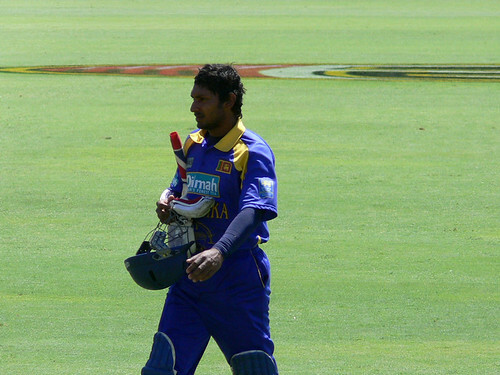 Sangakkara (Sri Lankan Captain) cheated during the toss in the game of gentleman’s; cricket. It was Indian captain, MS Dhoni who won the toss actually. Ravi Shastri congratulated Dhoni, and Dhoni shook hands with Sangakkara. Dhoni had batting first in his mind, but Sangakkara created a confusion there and pretended that he didn’t call. Crowe, the match referee also said that he didnt hear Sangakkara, Espn star which is broadcasting this match showed on the video replay that Kumar called heads both times. Dhoni thought he won, and Ravi Shastri congratulated him, but Crowe said he couldn’t hear Sangakkara well. It is believed that crowd noise in the stadium covered Sangakkara’s call, but such noise is very common thing in Indian subcontinent and far much lesser than previous Indo-Pakistan cricket match semi final. It has hardly ever happened before. Ravi Shastri was amused as he saw Sangakkara calling heads. After a hot discussion and growing tension among the crowd. Match Referee decided to toss the coin again and this time Sangakkara was lucky who had called for heads, winning the toss, he elected to bat first. Tossing a coin two times in a world cup final is a shame. The gentleman’s game is being ruined by selfish players now. In cricket before actually starting the match a coin is tossed to decide which team will bowl and which team will bat first, the winner of the coin toss can decide any of the two and carry on with the match. Toss decision is crucial as some times the pitch (field) is supportive to batsmen and sometimes to bowlers. It was Sri Lanka’s Suraj Randiv, who under the same captainship, purposely bowled a no-ball to Sehwag so that he can not get his century against Sri Lanka. Needing just one run to achieve his century of runs and with the scores already leveled, Sehwag hit the final delivery of the match off Randiv for a six but the umpire signalled a no-ball. India consequently won the match by six wickets but Sehwag was left on 99, says guardian.